Combine crumbs, parmesan cheese, lemon pepper and garlic salt. Put mixture in bag or plastic container with a lid. Dredge fillets in flour to completely dry the surface. This allows you to dip the flour coated fish in an egg wash (beat two eggs in a shallow bowl) and then shake in the breading. By dredging the fillets in flour first the breading will adhere to the fillet much better. Remember, dip fillets in flour, then egg wash and lastly the crumb mixture. Let the fillets rest for at least 15 minutes so that the egg can dry, which will allow the fillet to hold the breading. By allowing some drying time you will find that the breading does not fall off during frying. 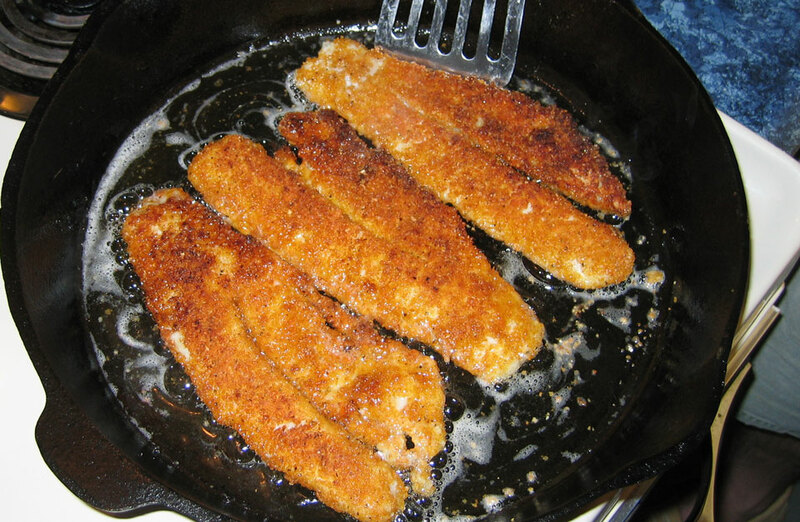 Heat ½ cup of lard or vegetable oil in a Camp Chef cast iron frying pan to medium-high heat and cook coated fillets till golden brown, about 2 to 3 minutes per side. *The crumbs can be from crushed Ritz crackers, Corn Flakes (can be purchased already as crumbs) or bread crumbs but the key ingredient is the cheese. Add lemon pepper, garlic salt or other spice of preference, if you like. You may also want to try a pretzel and beer coating, which I like to pair with pike.